The same quality compassionate care you have come to trust at Baptist is now available when you get home from the hospital. Home care services include nursing care registered nurses; physical, occupational and speech therapy; home health aides; and medical social service. Care is available 24 hours a day, seven days a week. Baptist Home Health Care is Medicare certified. Accredited by the Joint Commission on Accreditation of Healthcare Organizations. 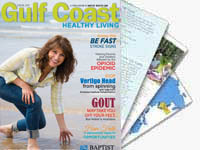 Baptist Home Health Care (BHHC) provides home health care services to the people of Northwest Florida. BHHC is committed to providing high quality, personalized care designed to support you and your family when you need it most. Our health care providers have an unwavering commitment to excellence and are dedicated to caring for our patients. Our staff is carefully selected based on experience, knowledge, training and service. Read about our home health provider and location.